“This is obviously not a vegan paradise,” muttered one of my guests in a quiet, slightly mortified tone as we jostled for position over a blue-lit fish tank, angling for our dinner. 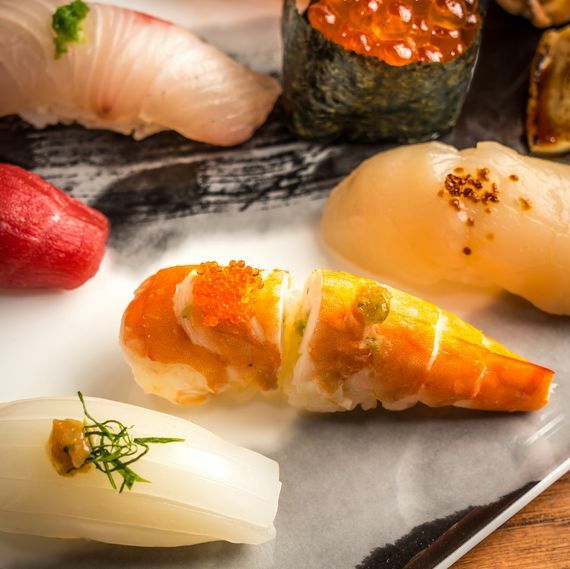 We were at Zauo, a popular Japanese restaurant chain that, in case you haven’t heard, just opened its first-ever boisterous, multilevel American branch in Chelsea. After signing a release form and ordering appetizers with a few nonalcoholic drinks (a liquor license is still forthcoming), we were issued our “license” and a fishing attendant handed us a tiny plastic rod and hook. You can fish for rainbow trout at Zauo, or striped bass, or a skittish kind of flounder flown in from Korea, but I opted to dangle my hook in front of the largest prey of all: a giant, tired-looking Frankenspecies called a salmon trout. “Try to go for the active-looking ones!” cried the attendant. To enhance the experience at Zauo, diners are handed a tank guide to help navigate their way through the boxy, three-level space, as well as a six-step “How to Enjoy” chart complete with diagrams. There are plenty of non-catchable items on the standard Japanese menu (nuggets of karaage fried chicken, noodles, run-of-the-mill sushi), but you’re here to fish. When you do finally haul your farm-raised catch from the tank, an antic “Catch Celebration” ensues with vociferous group chants and the loud banging of drums. The fish is then whisked to the kitchen where it’s killed and prepared in several different fashions. 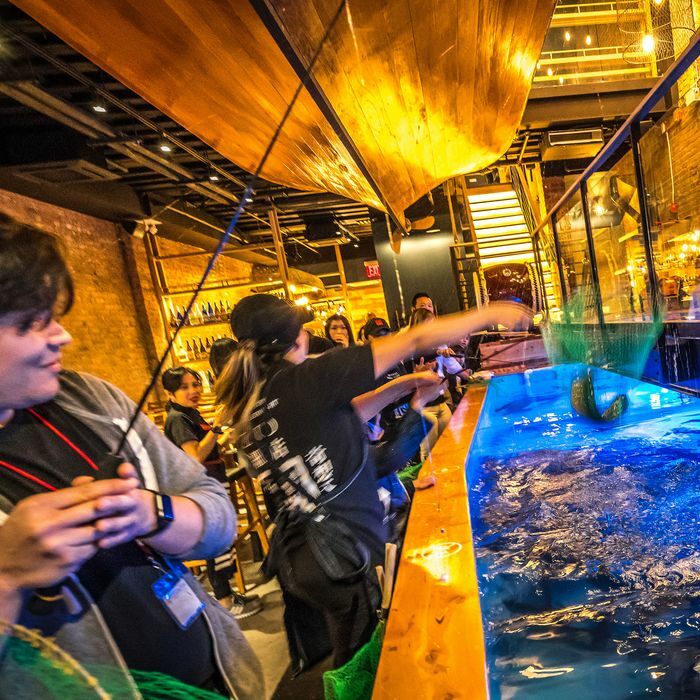 Oddly, in a strange year of New York dining that has already seen plenty of gimmicks, Instagram enticements, and circus diversions (hello, Salt Bae), catching a fish in a tank and then eating it actually doesn’t seem like such a novelty. “I wouldn’t call this the most relaxing experience, Dad,” one of my daughters said as we sat down at our table, which was located disconcertingly close to one of those constantly beating drums. 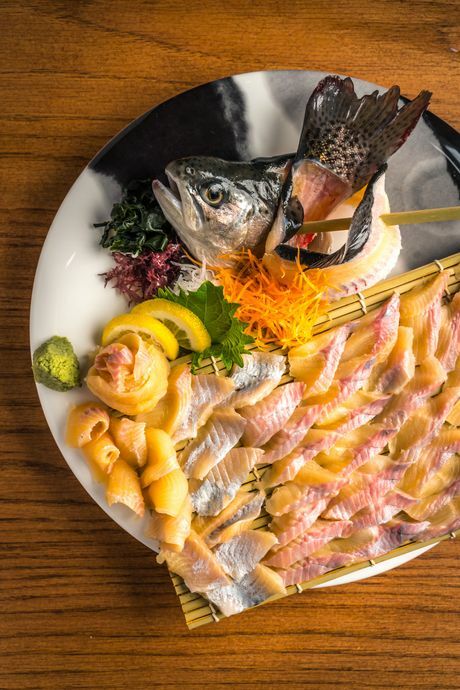 The experience became even less relaxing when a large portion of my almost distressingly oversize salmon trout arrived in sashimi form, cut into pink, tough slivers with the gaping, freshly severed head propped decoratively on the plate. “Imagine if they did this every time you ordered organic barnyard chicken at a restaurant,” one of my tablemates remarked, as we took a few queasy, hesitant bites. Servings of freshly prepared sashimi and sushi, as well as a look at the tank. Noah Fecks. The salmon trout tasted a little better in tempura form, where it was deep-fried and slightly more denatured. There was another portion that had been simmered in soy to a kind of inert saltiness, and there was an unpleasant toughness to the rest of the $110 salmon trout when it was served baked, with a little salt on the side. 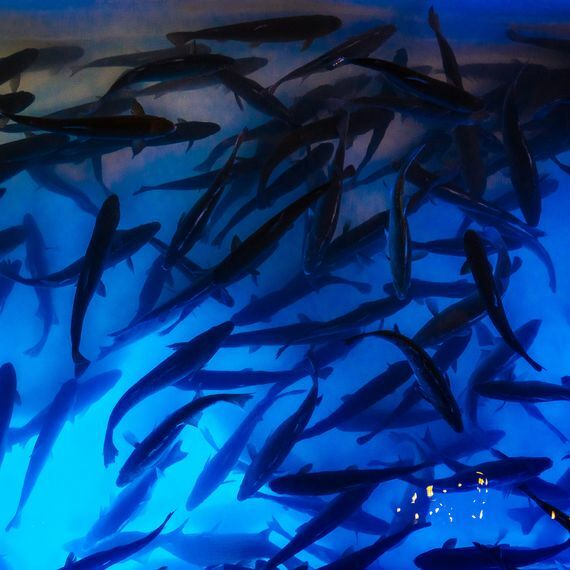 Ikejime is the famous Japanese method for killing the fish before fear and rigor mortis alter its texture and flavor, but that technique is conspicuously not practiced here. “Sometimes the fish muscles will get a little tense with fear,” our waitperson helpfully explained, as a slightly less tense-tasting lobster, which we’d also scooped from one of the tanks upstairs, arrived at the table. “I’m okay with just eating rice, Dad,” my daughter said, as she examined one of the glistening chunks of raw lobster flesh with her chopsticks and then politely put it back down. Having personally murdered many lobsters during a lifetime of pleasant summer vacations up in Maine, I didn’t mind this variety of sashimi quite as much. Although, if you’re planning to visit Zauo with a group of squeamish Instagrammers or, heaven forbid, a child’s birthday party (we saw more than a few excited boys and exasperated dads careening around the tanks with their fishing rods), you may want to ask your server to make sure the fish arrives fried in tempura, or at least without the decorative severed head, so that your kids won’t have to stare down in quiet horror at the just-killed seafood while its dead eyes stare back in such a creepy, recriminating way.